We report on the construction of maize minichromosomes using shuttle vectors harboring native centromeric segments, origins of replication, selectable marker genes, and telomeric repeats. These vectors were introduced into scutellar cells of maize immature embryos by microprojectile bombardment. Several independent transformation events were identified containing minichromosomes in addition to the normal diploid complement of 20 maize chromosomes. Immunostaining indicated that the minichromosomes recruited centromeric protein C, which is a specific component of the centromere/kinetochore complex. Minichromosomes were estimated to be 15–30 Mb in size based on cytological measurements. Fluorescent in situ hybridization (FISH) showed that minichromosomes contain the centromeric, telomeric, and exogenous unique marker sequences interspersed with maize retrotransposons. Minichromosomes were detected for at least a year in actively dividing callus cultures, providing evidence for their stability through numerous cell cycles. Plants were regenerated and minichromosomes were detected in root tips, providing confirmation of their normal replication and transmission during mitosis and through organogenesis. Assembly of maize artificial chromosomes may provide a tool to study centromere function and a foundation for developing new high capacity vectors for plant functional genomics and breeding. Evgueni V. Ananiev and Chengcang Wu contributed equally to this work. Novel materials described in this publication may be available for noncommercial research purposes on acceptance and signing of a material transfer agreement. In some cases, such materials may contain or be derived from materials obtained from a third party. In such cases, the distribution of material will be subject to the requisite permission from any third-party owners, licensors, or controllers of all or parts of the material. Obtaining any permission will be the sole responsibility of the requestor. The online version of this article (doi: 10.1007/s00412-008-0191-3) contains supplementary material, which is available to authorized users. Eukaryotic artificial minichromosomes are potentially high capacity vectors that have promising applications in both genomics and applied research. The first successful artificial chromosome was reported in a pioneering study by Clarke and Carbon (1980) using a native centromere and the origin of replication to generate stable vectors in Saccharomyces cerevisiae. While it would be over 15 years before the first report of artificial chromosomes in a higher eukaryote (Harrington et al. 1997), progress over the past 10 years in mammalian systems has been substantial. The development of a comparable artificial minichromosome platform in plants has not kept pace. Minichromosomes in higher eukaryotes can be generated via two approaches: by de novo assembly of an artificial minichromosome using appropriate sequences delivered into cells (“bottom-up” approach) or by the induced truncation or fragmentation of native chromosomes (“top-down” approach). The “bottom-up” approach has been used for assembly of a human artificial chromosome (HAC) by transfection of the cell line HT1080 with a mixture of human centromere-specific alpha satellite, telomeric, and genomic carrier DNA (Harrington et al. 1997). Later, several groups reported the successful assembly of stable HACs using either cloned centromere-specific tandem repeats of alphoid DNA or large centromeric DNA segments (Grimes and Cooke 1998; Ikeno et al. 1998, 2002; Henning et al. 1999; Ebersole et al. 2000; Rudd et al. 2003; Basu et al. 2005a, b). However, for reasons which are not yet clearly understood, reproducible assembly of HACs has only been accomplished in this one immortalized fibrosarcoma HT1080 cell line (Basu and Willard 2005). Analysis of HACs indicated that, upon delivery, DNA is probably subjected to rearrangements (multimerization, recombination, and/or amplification) resulting in artificial chromosomes which are much larger than the original constructs used for transformation (for review, see Lim and Farr 2004). In some clonal lines, HACs were unstable, resulting in loss of the minichromosome or integration into the host DNA (Shen et al. 2001; Rudd et al. 2003). In other cases, HACs were mitotically stable in the absence of selection for at least 9 months (Mejia et al. 2002). Recently, it has been demonstrated that HACs generated in HT1080 cells and subsequently transferred to mouse embryonic stem cells were mitotically stable, and further, could be successfully transmitted to progeny in mice (Suzui et al. 2006). The “top-down” approach is based on chromosome fragmentation or truncation and can be achieved by irradiation or integration of telomeric repeats. Fragmentation of mammalian chromosomes by irradiation to produce minichromosomes has been reported (Carine et al. 1986), but integration of telomeric DNA and consequent truncation of existing chromosomes has been more widely used, and may result in stable minichromosomes with predictable content and organization. Generation of truncated minichromosomes has been achieved in different human and mammalian cell lines (Heller et al. 1996; Kuroiwa et al. 1998, 2002a, b; Mills et al. 1999; Yang et al. 2000; Auriche et al. 2001; Saffery et al. 2001; Katoh et al. 2004). The artificial chromosome expression system is an example of chromosomal modification resulting from homology-based integration into centromeric, ribosomal DNA (rDNA), and other DNA sequences. Amplification of the integrated sequences occurs resulting in chromosomal fragmentation that can lead to smaller derivative chromosomes (Hadlaczky et al. 1991; Praznovszky et al. 1991). These fragmentation-derived minichromosomes have also been constructed with multiple site-specific integration loci for subsequent loading of additional sequences (deJong et al. 1999). Plant minichromosomes can be generated using techniques similar to those used for the construction of human minichromosomes. Several examples of plant minichromosomes generated via irradiation, transposon-mediated breakage, or telomere-mediated truncation have been reported. An unstable maize minichromosome comprising part of the short arm of chromosome 10 has been recovered as a result of pollen irradiation (Brock and Pryor 1996), and a number of minute chromosomes have been identified in oat–maize radiation hybrids (Riera-Lizarazu et al. 2000). A collection of small derivatives of the maize B chromosome has also been characterized (Kato et al. 2005). Chromosomal truncation after integration of telomeric repeats has been used to generate minichromosomes in maize (Yu et al. 2007). Finally, a recent report by Carlson et al. (2007) describes the in vitro construction of circular vectors containing centromeric sequences and selectable markers, subsequent introduction of these vectors into maize, and inheritance of these circular vectors. However, as described in Houben et al. (2008), these results are controversial and will require additional experimental confirmation. Although these recent reports are encouraging, the de novo assembly of a plant artificial chromosome similar to those described in human cells has not yet been reported. This is likely due to the high complexity and limited understanding of plant centromere organization (Houben and Schubert 2007). Plant centromeres are complex and can span over 1–3 Mb around the primary constriction (Jackson et al. 1998; Gindullis et al. 2001; Copenhaver 2003). In maize, several centromere-specific sequences have been identified, including the 156-bp tandem repeat CentC (Ananiev et al. 1998) and the family of maize centromere-specific retroelements (Ananiev et al. 1998; Zhong et al. 2002; Nagaki et al. 2003; Sharma and Presting 2008). Centromeres are composed of long arrays of centromere-specific tandem repeats, with unit lengths from 150 to 180 bp, which are interspersed with multiple copies of centromere-specific retrotransposons, as well as other retrotransposable elements found in plant genomes (Ananiev et al. 1998; Fransz et al. 2000; Nagaki et al. 2003). However, there are indications that only portions of the centromeric regions are involved in kinetochore formation (Zhong et al. 2002; Jin et al. 2004; Nagaki et al. 2004; Zhang et al. 2004). This complexity suggests that identification of DNA segments responsible for kinetochore formation may be a prerequisite for developing vectors that will undergo de novo assembly of centromeres, and therefore, artificial chromosomes. In this publication, we report on our selection strategy for bacterial artificial chromosome (BAC) clones containing centromeric sequences, BAC-based minichromosome shuttle vector construction, and formation of maize artificial chromosomes with functional de novo centromeres. Minichromosome shuttle vectors (BAC clones retrofitted with selectable and visible marker genes, origins of replication, and synthetic telomeric sequences) were delivered to immature embryo cells using microprojectile bombardment. The resulting artificial minichromosomes were detected in dividing callus cells and persisted for at least a year in culture. The minichromosomes were also observed in root tips of regenerated plants, indicating both stability of the artificial minichromosomes and their ability to replicate and transmit into daughter cells during cell division. Publicly available maize (Zea mays L.) inbred lines B73, Mo17, and hybrid high type II (Hi-II) (Armstrong and Green 1985) were obtained from internal Pioneer sources. Oat–maize (Seneca 60) addition lines (Kynast et al. 2001) were received from Howard Rines’ and Ron Phillips’ lab at the University of Minnesota. A DuPont proprietary maize genomic BAC library from maize Mo17 public inbred line was constructed in pBeloBAC11 or pIndigoBac536 essentially as described in Kim et al. (1996) under contract with the Shizuya Laboratory at the California Institute of Technology. Briefly, Mo17 genomic DNA was partially digested with HindIII or EcoRI restriction enzymes. The DNA fragments were size-fractionated in agarose gel and cloned in pBeloBAC11 HindIII site or pIndigoBac536 EcoRI site. The entire Mo17 genomic BAC library consisted of 166,272 total BAC clones with an average insert size of about 150 kb, representing 10× genome coverage. The first half of the library, comprising 214 plates, contained BAC clones with HindIII inserts, while the second half of the library, comprising 219 plates, contained BAC clones with EcoRI inserts. Two public maize B73 genomic BAC libraries were also used in the analysis. Library ZMMBBb is available from Clemson University Genome Institute and University of Georgia. The ZMMBBb BAC library was created by cloning HindIII partially digested maize B73 genomic DNA into the pIndigoBac536 vector. The ZMMBBb BAC library comprised 247,680 total BAC clones with an average insert size of about 137 kb, representing a 13.5× genome coverage. The second B73 BAC library (ZMMBBc) was created by Pieter de Jong's Laboratory at Children's Hospital Oakland Research Institute. The first segment of the library was constructed using DNA partially digested with a combination of EcoRI and EcoRI methylase, and the second segment was constructed using MboI partially digested DNA. Size-selected DNA was cloned into the pTARBAC2.1 vector (segment 1, plates 1–288) between the EcoRI sites, and into the pTARBAC1.3 vector (segment 2, plates 289–576) between the BamHI sites. The total ZMMBBc library comprises 212,216 individual BAC clones with an average insert size of 165 kb, representing a 14× genome coverage. Probes were designed as 40 bp overgo oligonucleotides. Probe labeling was performed as described in Gardiner et al. (2004). The same overgo oligonucleotides (Table S1), labeled with appropriate triphosphates, were used for colony and Southern blot hybridization, and in FISH experiments. Maize B73 and Mo17 BAC libraries were screened with overgo probes specific to four maize centromere-specific repeats: CentA, CentC, CRM, and CRM1 (Table S1; SEQ ID: 1–42) essentially as described in Gardiner et al. (2004). DNA isolation from immature ears or green leaves of maize plants was performed as in Ananiev et al. (1997). BAC clone DNA was isolated using a Nucleobond plasmid kit (BD Biosciences Clontech, Palo Alto, CA, USA) according to the manufacturer’s recommendations. DNA restriction digestion, gel electrophoresis, Southern blotting, and filter and colony hybridization were carried out using standard protocols (Sambrook et al. 1989). Polymerase chain reaction (PCR) analysis was performed using HotStarTaq Master Mix kit (Qiagen, Valencia, CA, USA) according to the manufacturer’s recommendations. To promote cell division and callus growth after the delivery of minichromosome constructs, we used two helper plasmids containing maize homologs to the Brassica babyboom gene (BNM3; Boutilier et al. 2002) referred to as ZmODP2 (Gordon-Kamm et al. 2005) and the Arabidopsis wushel gene (WUS; Mayer et al. 1998) referred to as ZmWUS (Lowe et al. 2004) driven by the ubiquitin (Christensen et al. 1992) and In2 (De Veylder et al. 1997) promoters, respectively, with both expression cassettes containing the pinII 3′ sequence (An et al. 1989). To confer the capabilities of both chemical selection of minichromosome events and visualization of a fluorescent phenotype, an expression cassette was assembled containing a fusion between the genes encoding a maize-optimized phosphinothricin acetyl transferase (MO-PAT; Rasco-Gaunt et al. 2002) and a red fluorescent protein (DS-RED; Clontech Laboratories Inc., Palo Alto, CA, USA) markers. This fusion gene was cloned between the maize ubiquitin promoter and the pinII 3′ sequence. Vectors for delivery into plant cells were constructed using standard molecular biology protocols, e.g., Sambrook et al. (1989). The EPICENTRE EZ::TN™ pMOD™-2 MCS Transposon Construction Vector system (EpiCentre, Madison, WI, USA) was used to retrofit genes and/or DNA fragments of interest into selected BAC clones. Based on this vector, we constructed a custom transposon, Tn5-3 (Fig. 1a), comprising an origin of replication (Ori) 18-26S rDNA NTS, visible (DS-RED) and selectable (MO-PAT) marker genes under the ubiquitin promoter (UBI1ZM PRO). The plasmid also contained two DNA fragments in inverted orientation, each composed of two recognition sites for the homing restriction enzymes (I-CeuI and PI-SceI) and segments of telomeric repeats (TEL) separated by the Kanamycin (Kan) resistance gene. In vitro transposition of the Tn5-3 transposon into the BAC DNA was performed according to the manufacturer’s recommendations (EpiCentre). Recombinant retrofitted BAC DNA was digested with a homing restriction enzyme (I-CeuI or PI-SceI) converting the circular DNA into a linear minichromosome shuttle vector flanked with telomeric sequences in the correct orientation and removing the fragment comprising the Kan resistance gene (Fig. 1b). In one experiment, the minichromosome shuttle vector was assembled using conventional ligation techniques (Figure S1). The DNA was precipitated onto 0.6 μm (average diameter) gold microprojectiles using a water-soluble cationic lipid Tfx™-50 (Promega, Madison, WI, USA) as follows: 20 μl of gold particles (water solution, 15 mg/ml) and 10 μl of Tfx™-50 water solution (prepared according to the manufacturer’s recommendations) were added to the premixed Tn5-3 retrofitted BAC DNA constructs (1 μg), 50 ng of a plasmid containing Ubi-PRO::ODP2::pinII, and 50 ng of a plasmid containing In2-PRO::WUS::pinII mixed gently and incubated on ice for 10 min. DNA-coated gold particles were then centrifuged at 10,000 rpm for 1 min. The pellet was rinsed with 100 μl of absolute alcohol. After another centrifugation at 10,000 rpm for 1 min, the pellet was rinsed with a fresh 20 μl aliquot of absolute alcohol and resuspended by a brief sonication. Immediately after sonication, DNA-coated gold particles were loaded onto the center of a macrocarrier (10 μl each) and allowed to air dry. Immature maize embryos 8–11 days after pollination were bombarded using a Bio-Rad PDS-1000/He Gun (Bio-Rad, Hercules, CA, USA) with a rupture pressure of 450 PSI. Postbombardment culture, selection, and plant regeneration were performed as previously described (Gordon-Kamm et al. 2002). FISH experiments on meiotic and mitotic chromosomes, and on extended DNA fibers (fiber-FISH) were performed as in Ananiev et al. (1998) and Svitashev and Somers (2001), respectively. DNA spreads for fiber-FISH were prepared from nuclei isolated from young leaves of oat–maize chromosome addition lines, each carrying one of the ten maize chromosomes (Kynast et al. 2001). Individual embryogenic callus lines derived from a single transformed cell and representing individual transformation events were gassed with nitrous oxide (Kato et al. 2004) at 140 PSI for 3 h then immediately fixed with 50% acetic acid and stored at −20°C. Somatic embryos were separated from callus and washed three times in protoplast isolation buffer (PIM; 50 mM CaCl2, 10 mM sodium acetate, pH 5.8). Cell wall digestion was performed in PIM solution containing 2% w/v cellulase (Worthington Biochemical Corp., Lakewood, NJ, USA), 0.2% w/v pectinase (Worthington Biochemical Corp.), and 0.5% w/v bovine serum albumin for 1–2 h at room temperature in the dark. The digestion solution was removed and replaced with PIM buffer. Tissues were gently pipetted to release protoplasts and transferred to a microfuge tube. Cells were pelleted in a microcentrifuge at 500 rpm for 5 min, and the supernatant was removed and replaced with fresh PIM buffer. Washing was repeated three times. After the last wash, the supernatant was removed and replaced with 50% acetic acid. Resuspended cells were transferred to a glass cytological slide, covered with a coverslip, and gently squashed. Slides were submerged in liquid nitrogen for 10–15 s; coverslips were quickly removed while frozen; and slides placed in 100% ethanol for 5 min, air-dried, and stored at −20°C. Overgo probes for FISH on chromosomes were labeled with fluorescein-12-dUTP (Roche, Germany), Cy3-dUTP (GE Healthcare, Piscataway, NJ, USA) or Texas Red-12-dUTP (Molecular Probes, Eugene, OR, USA). For fiber-FISH, probes were labeled with biotin-11-dUTP (Roche) and DIG-16-dUTP (Roche) using the Nick Translation Labeling Kit (Roche) according to the manufacturer’s recommendations. All microscopic observations were made with a Leica (Germany) DMRXA microscope fitted with epifluorescence and a mercury light source. Chroma Technology Corp. (Rockingham, VT, USA) fluorescent filter sets were utilized. Digital images were captured using a Photometrics’ CoolSnap HQ CCD camera (Tucson, AZ, USA) controlled by Metamorph software (Molecular Devices, Sunnyvale, CA, USA). Final image manipulations were made with Adobe PhotoShop (Adobe Systems Inc., San Jose, CA, USA). A maize homolog of mammalian Centromeric Protein C (CENPC) was isolated by Dawe et al. (1999) and shown to be a component of the kinetochore in maize. A 20 amino acid conserved peptide from the C-terminal domain KVKSFVPEQYSDLVAKSARY was synthesized and used for polyclonal antibody production in rabbits (Open Biosystems, Huntsville, AL, USA). The resulting antibodies were directly labeled with flurophores using the Fluorolink-Ab Cy3 labeling kit (GE Healthcare). After examination and characterization of FISH probe localization, these same samples can be processed and used for immunolocalization. Immunolocalization with fluorescently tagged anti-CENPC antibodies was done as follows. Following FISH analysis, coverslips were removed and the slides were washed in 70% v/v EtOH for 5 min to remove mounting medium and residual immersion oil, and then washed three times (5 min each) in phosphate-buffered saline (PBS). Preparations were blocked for 1 h at 37°C in a moist chamber in 5% v/v normal rabbit serum (Jackson Immunoresearch, West Grove, PA, USA) in PBS-BT (PBS with 3% w/v BSA, 0.02% w/v Na azide, 0.5% v/v Triton X-100), and then rinsed in PBS. Preparations were then incubated overnight at 37°C in a moist chamber with labeled antibody (rabbit anti-CENPC-Cy3) diluted to a final concentration of 3.0 μg/μl in 5% v/v normal rabbit serum in PBS-BT. Slides were washed three times in PBS over a 3-h period and then air-dried. Coverslips were mounted on slides using Vectashield® with 4′,6-diamidino-2-phenylindoledihydrochloride (DAPI; Vector Laboratories, Burlingame, CA, USA) and analyzed under the fluorescent microscope using the appropriate filter sets. Maize centromeric regions contain multiple copies of centromere-specific repeats which occupy significant DNA segments in each chromosome (Ananiev et al. 1998; Zhong et al. 2002; Nagaki et al. 2003; Sharma and Presting 2008). In this study, we used four elements, including a 156-bp tandem CentC repeat (Ananiev et al. 1998) and three retrotransposons: CentA (Ananiev et al. 1998), CRM (Zhong et al. 2002), and a new retroelement CRM1. This retroelement has 98.4% identity to the recently published CRM1_76_B (Sharma and Presting 2008). To evaluate the size, composition, and structural organization of individual centromeres, probes developed for four centromere-specific repeats were used individually, and in a cocktail, for FISH on maize mitotic and meiotic chromosomes, and on extended DNA molecules (fiber-FISH). Multi-color FISH on maize (Mo17) pachytene and diplotene chromosomes revealed that all four repeats colocalized in the centromeric regions of all ten chromosomes (Fig. 2a). FISH analysis showed that retrotransposons CentA, CRM, and CRM1 were, in general, equally represented in each maize centromere with CentA having the weakest hybridization signal. The strength of the CentC hybridization signal varied among different maize chromosomes reflecting the polymorphism in copy numbers. In Mo17, the weakest signal was detected on chromosomes 4 and 5, while the strongest signals were observed on chromosomes 1, 7, 8, and 9. Similarly, variation in intensity of CentC hybridization signals has been reported in Kato et al. (2004) when CentC was used as one of nine repetitive sequences for somatic chromosome identification in 14 maize genotypes. Using a chromatin immunoprecipitation assay with antiserum to maize centromeric histone H3 (CENH3), Zhong et al. (2002) demonstrated that CentC and CRM repeats are involved in kinetochore formation and are necessary components of functional centromeres. These authors also suggested that other sequences located within the centromeric region may interact with CENH3 as well. To confirm and extend such observations regarding centromere organization in maize, we performed immunofluorescence coupled with FISH on Mo17 meiotic anaphase I chromosomes to determine the relationship of centromeric repeats to the kinetochore. Labeled antibodies to the kinetochore-specific maize homolog of mammalian centromeric protein C, CENPC (Dawe et al. 1999), showed equal signal strength and a uniform size across the centromeres of all ten maize meiotic chromosomes. In our analysis, CENPC colocalized with CentC repeats at the attachment point of the spindle apparatus, but the signals did not completely overlap (Fig. 2b). In addition, we observed that the four centromeric repeats appeared to colocalize on the homologs at the central point of attachment of the spindle apparatus (Figure S2). Consistent with earlier observations made by Zhong et al. (2002), the incomplete overlap of CentC and CENPC and the colocalization of all four repeats at the central point of attachment of the spindle apparatus suggest that centromeres may have several functional subdomains, each of which can bind kinetochore proteins. In addition, we thought it likely that all four centromeric repeats used in our analysis might be necessary for kinetochore formation and establishment of functional centromeres in maize chromosomes. Fiber-FISH is a technique which can be used to further characterize the distribution and arrangement of centromeric repeats at higher resolution. Oat–maize (Seneca 60) chromosome addition lines have been developed at the University of Minnesota (Kynast et al. 2001) and contain a complete set of oat chromosomes plus a homologous pair of each of the ten maize chromosomes. Fiber-FISH on seven oat–maize addition lines was performed by Jin et al. (2004) using CentC and one of the retroelements, CRM, as probes. These researchers demonstrated that these two repeats are interspersed with each other at the core of maize centromeres. They have also shown that CentC and CRM repeats are associated with the centromere-specific histone H3 (CENH3). While CENH3 was always associated with CentC and CRM, not all CentC and CRM sequences were associated with this protein. Based on this analysis, the authors estimated the size for functional centromeres in maize to be between 300 and 700 kb. We used nine addition lines (no chromosome 5) for the analysis of centromeric regions of individual maize chromosomes using the CentC repeat (visualized with fluorescein) and a mixture of CentA, CRM, and CRM1 (visualized with Cy3 fluorescent dye) as probes (Fig. 2c). Fiber-FISH revealed megabase-long hybridization stretches of centromeric repeats unique for each chromosome. The centromeres of maize chromosomes 1, 7, and 8 had the longest stretches of the CentC repeat while the centromeres of chromosomes 4 and 10 had the shortest tracts of this repeat. In chromosomes 1, 7, and 8, all four repeats were interspersed along the entire centromeric region detected (over 2 Mb). In other chromosomes, however, CentC was present as relatively short stretches (about 300–400 kb) flanked by long (up to more then 1 Mb) “loose” arrays of the other three centromeric repeats. These flanking regions showed an intermittent pattern of fluorescent foci, indicating that centromeric retrotransposons were interspersed with unknown DNA sequences including noncentromere-specific retroelements. These FISH and immunolocalization results suggested that the functional centromeric segment responsible for the formation of the kinetochore comprises only a fraction of the overall length of the chromosomal segment hybridizing to centromere-specific probes, and that the functional region most likely includes all four centromeric repeats (CentC, CentA, CRM, and CRM1) used in our analysis. Based on the results of cytological analysis of maize centromere organization, our hypothesis was that the high density region comprising all four centromere-specific repeats used in our study is responsible for kinetochore formation and, therefore, for centromeric function. Screening the Mo17 genomic BAC library identified approximately 8,000 clones (out of 166,272), which hybridized to at least one of the four centromere-specific probes. However, only 257 BACs hybridized to all four centromeric repeats and were identified as “core set” BAC clones. Since the Mo17 BAC library had an average insert size of approximately 150 kb and 10× genome coverage, these BACs comprised approximately 0.15% of the maize genome or represented DNA segments of about 375 kb per centromere. Because of the 10× genomic coverage of the library, we anticipated the 257 “core set” BAC clones would show significant redundancy. Therefore, DNA was isolated from all “core set” BAC clones, digested with the restriction endonucleases XmnI (single recognition site within the CentC monomer) and RsaI (no recognition site within the CentC monomer), blotted, and hybridized consecutively with all four centromere-specific repeats as probes (for example, see Figure S3). Based on similarities in Southern hybridization patterns, we divided the 257 “core set” BAC clones into 84 groups. One representative from each group was selected and these 84 “core set” BAC clones were utilized in transformation experiments. We also attempted to identify BAC clones specific to a single centromere. Based on our FISH analyses on chromosomes and extended DNA fibers, chromosome 4 contained the shortest CentC hybridizing region with an estimated size of about 300 kb in Seneca 60 and 200 kb in B73 inbred lines (Fig. 3a). This region, which potentially contains the functional centromeric DNA sequence, could be represented by only two overlapping BAC clones. Chromosome 4-specific centromeric BAC clones were identified as follows. End sequences of all centromere-positive BAC clones from the Mo17 BAC library (10,965 BAC end sequences) were searched for the presence of unique DNA sequences and 74 such sequences were identified. A pair of PCR primers was designed for each of the 74 sequences (Table S1; SEQ ID: 43–190) for mapping on oat–maize chromosome addition lines. This approach allowed us to assign each unique sequence to the individual maize chromosome (for example, see Fig. 3b). The BAC clone bacm.pk108.h15 was mapped to chromosome 4. This clone belonged to a contig with several BACs, which also hybridized to the CentC repeat. Partial sequence analysis confirmed that two BAC clones from this contig, bacm.pk010.m7 and bacm.pk184.c21, overlapped with bacm.pk108.h15 and shared the same unique sequences. Three additional unique DNA sequences were identified within these three BAC clones and were used to confirm their chromosome 4-specificity by PCR using DNA from oat–maize addition lines. Corresponding chromosome 4-specific overgo probes (Table S1; SEQ ID: 191–196) were developed and used for screening the B73 public BAC library. Seven B73 BAC clones, ZMMBBb0155H15, ZMMBBb0424D20, ZMMBBc0048G5, ZMMBBc0143I9, ZMMBBc0237J16, ZMMBBc0237M8, and ZMMBBc0270C1, were selected based on hybridization results. Six of seven B73 BAC clones (except the clone ZMMBBb0424D20) were put in a contig based on their restriction site analysis (Fig. 3c). Two BAC clones, ZMMBBb0155H15 and ZMMBBc0143I9, overlapped across a segment about 50 kb in length and covered the entire contig region of about 240 kb. Two groups of BAC clones representing the centromeric region of chromosome 4 from Mo17 and B73 inbred lines were selected for minichromosome construction and transformation experiments (Table S2 online). Our BAC clone selection was based on two criteria. The first relied on cytological analysis of maize centromeres, which elucidated the distribution of four centromere-specific repeats used in our analysis. The second one relied upon early work in Schizosaccharomyces pombe, demonstrating that inverted arrays of centromere-specific repeats were essential for proper centromere function (Clarke et al. 1986; Clarke and Baum 1990; Steiner et al. 1993). Inverted arrays of tandem centromere-specific repeats (CentO) have also been observed in rice (Wu et al. 2004). Therefore, we decided to look for this type of organization of CentC repeats in Mo17 and B73 BAC clones. We performed a BLAST search of the BAC-end sequence database containing CentC repeats. In the Mo17 BAC ends, 591 BAC-ends were found, among which 55 BAC clones contained CentC repeats on both ends, and only one clone (bacm.pk128.j21) had CentC repeats in an inverted orientation. Similar analysis of the public B73 BAC-end sequence database revealed 136 BAC-ends containing CentC repeats. Five BACs contained CentC repeats on both ends and one clone (ZMMBBb0243L15) had CentC repeats in an inverted orientation. The Mo17 BAC clone bacm.pk128.j21 had an insertion of about 80 kb and the B73 BAC clone ZMMBBb0243L15 had an insertion of about 150 kb. DNA of these BAC clones was isolated, digested with XmnI restriction enzyme (one recognition site within the CentC monomer), fractionated on an agarose gel, blotted, and hybridized with four centromere-specific repeats: CentC, CentA, CRM, and CRM1 (Fig. 4a). The Mo17 clone bacm.pk128.j21 hybridized with CentC and CRM1 repeats, whereas the B73 BAC clone, ZMMBBb0243L15, hybridized with all four centromeric repeats. The 10-kb fragment of bacm.pk128.j21 was sequenced and shown to comprise one full copy and one partial copy of the CRM1 retrotransposon flanked by partial copies of CentC repeats in inverted orientation. A schematic representation of this region, based on sequencing data and hybridization analysis is shown in Fig. 4b. In our first transformation experiments, pooled BAC clones comprising centromeric DNA (both circular and linear) were retrofitted with constructs containing Ubi-PRO::MO-PAT∼DS-RED::pinII. To promote cell division and callus growth after transformation, retrofitted BACs were co-bombarded with two plasmids containing the developmental genes ZmODP2 and ZmWUS. FISH analysis of 110 individual events revealed only integration of the delivered DNA into native chromosomes, similar to the results described in Phan et al. (2007). Similarly, when centromeric sequences were mixed with telomeric segments and delivered into maize immature embryo cells, only integrations into native chromosomes were detected in 70 analyzed events. However, in contrast to the first experiments, in which telomeric sequences were not included, we detected multiple examples of chromosomal rearrangements, such as truncations, translocations, and acrocentric chromosomes. These results indicated that protection of our centromeric DNA with telomeric sequences may result in the formation of functional telomeres and, consequently, prevent newly formed structures from integration into native chromosomes. This prompted us to develop an alternative strategy for construction of minichromosome shuttle vectors containing, besides centromeric DNA and selectable markers, a replication origin and telomeric fragments. The genetics and sequence basis for origins of replication remain uncertain in higher eukaryotes. In general, origins of replication have been shown to be spread regularly and occur approximately every 100 kb in mammalian DNA (Todorovich et al. 1999). This suggests that large genomic DNA fragments used in artificial chromosome construction would likely contain replication origins. Nevertheless, we decided to equip our vectors with sequences containing origins of replication. A well-established replication origin is the nontranscribed spacer of the 18–26S rDNA of S. cerevisiae (Ivessa and Zakian 2002), which is likely to be functional in other eukaryotes (Hernandez et al. 1993). Therefore, in our vector construction we used the maize PvuII DNA fragment of the nontranscribed spacer of maize 18–26S rDNA presumably containing the replication origin (Figure S4). The highly conserved, repetitive nature of telomeres allowed PCR amplification of telomeric sequences suitable for vector construction. Fragments of tandem telomeric repeats (CCCTAAA)n were produced by several rounds of PCR amplification using the primer pair of SEQ ID: 197 and 198 (Table S1) which were then cloned. A short, 239 bp, synthetic telomeric sequence was used in our minichromosome shuttle vector construction. Based on the EPICENTRE EZ::TN™ pMOD™-2 MCS Transposon Construction Vector system (EpiCentre), we built a custom-made transposon, Tn5-3, comprising an origin of replication, and visible (DS-RED) and selectable (MO-PAT) marker genes driven by the ubiquitin promoter. The plasmid also contained two DNA fragments in inverted orientation, each composed of two recognition sites for the homing restriction enzymes (I-CeuI and PI-SceI) and fragments of telomeric repeats separated by the Kanamycin (Kan) resistance gene (Fig. 1a). Ninety-four BAC clones, including 84 “core set” BAC clones, nine chromosome 4-specific BAC clones and one BAC clone with the inverted CentC arrays were retrofitted with the Tn5-3 custom-made transposon. Upon transposition, recombinant BAC DNA was digested with a homing restriction enzyme (I-CeuI or PI-SceI) converting the circular plasmid into a linear minichromosome shuttle vector flanked with telomeric sequences in the correct orientation and removing the fragment comprising the Kan resistance gene (Fig. 1b). The 84 “core set” minichromosome vectors were divided into four pools with 21 vectors per pool (Table S3). Each pool was used to transform maize immature embryos via microprojectile bombardment. In addition, transformations were performed using two pools of chromosome 4-specific BAC-based vectors (six Mo17 and three B73 BACs). In the case of the BAC clone with inverted CentC repeats (bacm.pk128.j21), the minichromosome shuttle vector was assembled using conventional ligation techniques (Figure S1) and transformed individually. Two additional plasmids carrying ZmODP2 and ZmWUS were co-bombarded with the minichromosome shuttle vectors to promote division of transformed cells and increase transformation efficiency. In total, 450 clonal lines representing individual transformation events (all recovered from the treatments containing ZmODP2 and ZmWUS) were analyzed by FISH using the CentC repeat and the DS-RED (Table S1; SEQ ID: 199–274) exogenous marker as probes. Minichromosomes were detected in 15 events (Table 1 and Fig. 5). However, when the same BAC clones that successfully produced minichromosomes were used without ZmODP2 and ZmWUS, no minichromosome-containing events were observed. Out of over 6,500 embryos initially used for transformation, 149 recovered events contained integrated BAC sequences, but no minichromosomes were detected. Seven of the 15 minichromosome events contained 20 (or 40 in one tetraploid event) native chromosomes, complemented with one, two, or three minichromosomes that hybridized to probes specific for CentC and the DS-RED marker (for examples, see Fig. 5a–d). The remaining nine events contained 19 chromosomes plus one or two minichromosomes suggesting the minichromosomes resulted from either truncation of a native chromosome or de novo centromere assembly associated with integration and later breakage of one of the native chromosomes (for example, see Fig. 5e,f). Two of the four pools of the “core set” BAC clones generated two events (CMC3 pool 1 event #14 and CMC3 pool 3 event #12) with minichromosomes. FISH analysis showed the presence of one, two, or three minichromosomes in addition to the diploid set of 20 native chromosomes in 75% (60 out of 80) of the metaphase nuclei surveyed for CMC3 pool 1 event #14 (Fig. 5a) and 40 native chromosomes (tetraploid set) complemented with one or two minichromosomes in 83% (19 of 23) of the metaphase nuclei surveyed in CMC3 pool 3 event #12 (Fig. 5b). BAC clones from pool 1 were then divided into four subpools, five to six BAC clones each, for further transformation experiments (Table S4). FISH analysis demonstrated the presence of minichromosome(s) in embryogenic callus generated using subpools 1.1 and 1.3. Subpool 1.3 produced seven minichromosome events (6.8%). Three events contained minichromosomes in addition to the diploid set of maize chromosomes (for example, see Fig. 5c). The remaining four events had 19 native chromosomes and one minichromosome that likely resulted from truncation of native chromosomes. Individual BAC clones from subpool 1.3 were further used to transform immature embryo cells. Two BAC-based minichromosome shuttle vectors, CMC3 bacm.pk119.a23 and CMC3 bacm2.pk174.e4, produced minichromosomes. Both events contained a diploid set of maize chromosomes complemented with one to two minichromosomes (for example, see Fig. 5d). The BAC clone with the inverted CentC repeats (bacm.pk128.j21) produced one event with one minichromosome plus 19 normal chromosomes with the loss of one of the chromosome 6 homologues, suggesting minichromosome formation through truncation of both arms of chromosome 6 (Fig. 5e). One minichromosome event, bCMC4 event #73, was identified when a group of three B73 chromosome 4-specific retrofitted BAC clones was used. FISH analysis showed that this event was aneuploid, with 19 native maize chromosomes and two minichromosomes (Fig. 5f). The larger minichromosome most likely resulted from truncation and appeared to have retained the original centromere. It also exhibited the presence of the DS-RED probe on both telomeric segments, consistent with integration and breakage. The smaller minichromosome likely represents a reciprocal product of a truncation event in which de novo centromere formation had occurred. Minichromosomes varied in size and, based on cytological comparison against chromosome 6, were estimated to be between 15 and 30 Mb, which was at least 100-fold larger than the linear constructs used for transformation. This suggests that these minichromosomes resulted from concatenation and/or amplification of the primary linear DNA constructs delivered to the plant cells. When two probes, CentC and DS-RED, were used in FISH experiments, some parts of the minichromosomes showed only DAPI staining with no hybridization with these two probes, indicating possible acquisition of genomic DNA fragments during the process of minichromosome assembly. Alternatively, the minichromosomes may have been formed through initial integration of the delivered DNA into a native chromosome followed by chromosome breakage and activation of a new centromere. To distinguish between these two mechanisms (de novo assembly versus an integration/truncation mechanism), we analyzed minichromosome composition using cytological methods in three events (CMC3 pool 1 event #14, CMC3 subpool 1.3. event #27, and CMC3 bacm2.pk174.e4 event #96) where minichromosomes complemented 20 native maize chromosomes. The first stage of this analysis comprised karyotyping of the native chromosomes in both wild-type and transgenic cells using a set of repetitive probes similar to those used in Kato et al. (2004). These included a nontranscribed spacer of 18–26S rDNA, a 180-bp knob repeat, microsatellite AGT repeat, and a 266-bp subtelomeric repeat (Table S1; SEQ ID: 345–374) in addition to the CentC repeat. This analysis indicated that no visible chromosomal rearrangements and/or aberrations were present in native chromosomes in all three events (for example, see Fig. 6a). In addition, the minichromosomes did not hybridize to any of the probes except CentC. We then hybridized our minichromosomes with a mixture of five entire BAC-based constructs from subpool 1.3. This probe hybridized across the entire body of the analyzed minichromosomes, indicating they contained a high proportion of delivered DNA molecules (for example, see Fig. 6b). To detect the presence of genomic DNA sequences, we also developed a set of overgo probes (Table S1; SEQ ID: 275–344) specific to the LTR regions of six abundant genomic retroelements: Cinful-1, Grande, Huck, Opie-2, Prem-2/Ji, and Tekay as described in Mroczek and Dawe (2003). Southern hybridization indicated the presence of at least one of these retroelements in 11 out of 21 BACs from pool 1. Four retroelements, Opie-2, Huck, Prem-2, and Grande, which were present in only five of 21 BACs, were labeled separately and used in a cocktail to paint chromosomes in minichromosome events. Minichromosomes from the event generated using pool 1 (CMC3 pool 1 event #14) were found to contain these retroelements, but the origin of these retrotransposons could not be determined since five of these 21 pooled BACs hybridize to these sequences in Southerns. We, therefore, decided to analyze another event (CMC3 subpool 1.3 event #27) generated using a smaller pool of five BACs, among which, only one BAC hybridized to Prem-2 but not to the other three retroelements. Even in this event, we still observed strong, interspersed coverage of the minichromosomes when all four probes were used simultaneously (Fig. 6c). However, using each of the four retrotransposon (RT) sequences as individual probes produced significantly different patterns. While Huck was highly interspersed across the minichromosome, the remaining three retroelements were present at low levels (Fig. 6d). For two of the events analyzed in detail, the hybridization results clearly indicated that the introduced BACs and the retroelements were interspersed with each other (Fig. 6b, d). For the third minichromosome event analyzed in this manner (CMC3 bacm2.pk174.e4 event #96), the retroelements covered the entire body of the minichromosome while the BAC sequences covered approximately half. Hybridization with the ZmODP2 and ZmWUS probes demonstrated the incorporation of these plasmids into the minichromosomes during the process of assembly (for example, see Fig. 6e). Finally, we tested the artificial minichromosomes for the presence of telomeric sequences by FISH using a (CCCTAAA)n probe. Telomeric DNA was detected in normal chromosomes and in every minichromosome tested. For example, in CMC3 pool 1 event #14, the larger minichromosome demonstrated the presence of four telomeric sequence-positive foci, one at each end of the two sister chromatids (Fig. 6f). At this juncture, we cannot draw an unequivocal conclusion as to the mechanism of minichromosome formation. Nevertheless, based on our data, we conclude that minichromosomes in some events clearly resulted from chromosomal breakages, while observations made on other events were consistent with the possibility that the minichromosomes formed de novo. Antibodies specific to centromere-associated proteins, such as CENPC, can be used to confirm assembly of a functional centromere/kinetochore complex in artificial minichromosomes. A maize homologue of mammalian CENPC was isolated by Dawe et al. (1999) and shown to be a component of the kinetochore in maize. We thus used nuclear spreads of minichromosome events to perform sequential FISH with CentC and DS-RED probes followed by immunolocalization for CENPC. Immunofluorescence confirmed that CENPC bound specifically to the centromeric region of native chromosomes, as well as to all minichromosomes observed (for examples, see Fig. 7). Similar results were observed when immunostaining preceded FISH. Immunolocalization of CENPC antibodies combined with FISH using CentC and DS-RED as probes demonstrated colocalization of a portion of the CentC repeats, the exogenous marker, and the kinetochore-specific protein CENPC (Fig. 7a). These results indicated that the minichromosomes possessed functional de novo centromeres which recruited the necessary proteins for kinetochore formation in cellulo. The minichromosomes have functional centromeres that allow for their autonomous replication and segregation into daughter cells (Fig. 7b). Several transformation events in which simple integrations into native chromosomes had occurred (i.e., FISH positive for CentC and the DS-RED marker) were tested with CENPC antibodies. CENPC was not detected at these integration sites (for example, see Figure S5). This suggests that integration loci containing the introduced centromeric BAC sequences alone were not sufficient to recruit proteins involved in kinetochore formation, and therefore, centromeric function. Minichromosomes were present in 65% (CMC3 subpool 1.3, event #27) to 95% of nuclei analyzed (bacm2.pk174.e4, event #96) indicating different levels of stability and mitotic transmission. Interestingly, the lowest stability appeared to be associated with the smallest minichromosome, while the larger minichromosomes showed much higher levels of mitotic transmission. Minichromosomes that had functional centromeres (CENPC positive) were maintained for more than a year (more than 100 cell divisions), and maintained the same ratio of minichromosome-carrying cells. Attempts were made to regenerate plants from calli containing minichromosomes, but with limited success. ZmODP2 and ZmWUS, co-transformed with minichromosome constructs, promote active cell division and callus proliferation resulting in increased transformation frequency. However, strong constitutive expression of ZmODP2 was not conducive to the recovery of mature plants. Nevertheless, we were able to regenerate plants from calli of three different events with minichromosomes derived from introduction of pool 1 BAC-based minichromosome vectors (event #14), the individual BAC clone from pool 1, bacm2.pk174.e4, and the BAC clone bacm.pk128.j21 containing arrays of inverted CentC repeats. Regenerated plants from these events were analyzed for the presence of minichromosomes. In the case of the CMC3 pool 1 event #14, 19 plants were produced and five showed the presence of artificial minichromosome(s) in root tips. In the transgenic event generated using the construct with arrays of inverted CentC repeats, three out of six regenerated plants showed the presence of the minichromosome in addition to 19 native maize chromosomes. In these two events, selection was not applied throughout the regeneration process, potentially permitting nontransformed sectors to regenerate. In the case of bacm2.pk174.e4, selection was applied through all regeneration steps, and as a result, all six regenerants demonstrated the presence of minichromosomes. All regenerated plants were both male and female sterile, likely due to expression of ZmODP2. The assembly of artificial chromosomes relies upon two fundamentals: DNA fragments capable of imparting centromeric function and the plant cell’s ability to decorate naked DNA with centromere-specific proteins to form a functional kinetochore. We have demonstrated that transformation of BAC-based constructs comprising centromere-specific segments, telomere sequences, origins of replication, and selectable/visible markers can result in the formation of artificial minichromosomes in maize immature embryo cells. FISH data, mitotic stability, and ability to recruit in cellulo centromere-specific proteins indicated that all minichromosomes possess functional centromeres and telomeres. Plant centromeres vary considerably in their size, both among and within species, and can span regions of several megabases (Ma et al. 2007). However, there are several lines of evidence indicating that just a small fraction of the original native centromere can retain centromere function (Maguire 1987; Ananiev et al. 1998; Yang et al. 2000; Spence et al. 2002; Zhong et al. 2002; Jin et al. 2004; Phelps-Durr and Birchler 2004). Thus, identification of this small fraction of DNA segments that confers centromere function, and kinetochore formation, becomes a critical prerequisite for de novo centromere formation and artificial chromosome assembly. Several attempts have been made to estimate the size of functional centromeres using antibodies against CENH3 protein, a centromere analog of histone H3 which is incorporated into nucleosomes underlying the kinetochore structure. The size of CENH3-binding domains appears to be similar across species [in Drosophila, about 400 kb (Sun et al. 2003); in the human Y chromosome, about 500 kb (Tyler-Smith et al. 1993); in rice chromosome 8, about 750 kb (Nagaki et al. 2004); in Arabidopsis, about 500 kb (Murata et al. 2008); and in maize, 300–700 kb (Jin et al. 2004)] suggesting a possible size requirement for functional centromeres. Analysis of minimal centromere size has been performed on human minichromosomes (Yang et al. 2000) demonstrating that functional centromeres require a minimum of about 100 kb of alphoid DNA. A similar study on derivatives of natural maize B chromosomes showed the smallest centromere size to be approximately 110 kb (Phelps-Durr and Birchler 2004). Several examples of human artificial minichromosome formation within a cell upon delivery of synthetic modified alphoid DNA sequences (Harrington et al. 1997; Ohzeki et al. 2002) indicate that a simple array of alphoid DNA repeats is sufficient to form a functional centromere. These observations, however, may not be applicable to all species. For example, in plants such as Arabidopsis, rice, and maize, centromere regions are composed of complex mixtures of centromere-specific retrotransposons and arrays of relatively short (150–300 bp) tandem repeats. It is still not clear which of these components are crucial for centromere function. Moreover, multiple examples of neocentromere formation in human cells (for review, see Warburton 2004) and the observation of a neocentromere in plants (Nasuda et al. 2005) indicate that noncentromeric sequences can be recruited and act as centromeres. These data suggest that various factors, such as chromatin structure or higher-order repetitive sequence organization, may play an important role in centromeric function. The eukaryotic species in which centromeric regions have been most thoroughly characterized is S. pombe (Clarke et al. 1986; Clarke and Baum 1990; Polizzi and Clarke 1991; Steiner et al. 1993). S. pombe centromeric regions are from 40 to 80 kb, which is comparable with the size of centromeres in higher eukaryotes. Clarke and coworkers found that every S. pombe centromere consists of a central core region (5–7 kb long) flanked by repeats in an inverted orientation. This structure, not the DNA sequence, was conserved in all chromosomes and found necessary for proper centromeric function, as demonstrated when neither the central core nor one arm of the inverted repeat could function as a centromere. Similarly, analysis of two classes of Trypanosoma brucei chromosomes has indicated that these chromosomes are organized around core regions which were shown to be repetitive palindromes, tandem 177 bp repeats with single inversion points (Wickstead et al. 2004). A mitotically stable linear extra chromosome obtained in the lower eukaryote, Leishmania donovani, has been shown to have a similar inverted duplicated structure around a central inversion (Dubessay et al. 2001). Sequencing of the centromeric regions in rice chromosome 8 (Wu et al. 2004) has revealed a remarkably similar structural organization, with long arrays of CentO repeats organized in inverted orientation, separated by approximately 8 kb of the retroelement RIRE7. Based on the above observations, we looked for examples of this organization in maize centromeric BAC clones. Two BAC clones with inverted arrays of CentC repeats were identified. BAC clone bacm.pk128.j21 was partially sequenced and shown to consist of two arrays of the CentC repeats in an inverted orientation separated by one and a half copies (approximately 10 kb long) of the maize centromere-specific retroelement CRM1. These data combined with FISH and immunostaining results led us to propose a model for corn centromere organization (Fig. 8). The central region, responsible for centromeric function, kinetochore formation, and microtubule attachment, consists predominantly of centromere-specific repeats where CentC repeats form arrays organized in an inverted orientation. These inverted arrays are separated by one or more copies of the retroelements, which represents a demarcation between chromosome arms. Other elements such as centromeric and noncentromeric retroelements can be found interspersed within arrays of CentC repeats, possibly as a result of transposition into this region. The similarity in this structural organization across a diverse range of eukaryotes is intriguing and suggests that inverted arrays of tandem repeats may be a universal feature across species and necessary for centromere function. While this model is currently speculative and needs more experimental data across a broad number of species to be confirmed or rejected, we believe it provides an interesting framework for future experimentation. The model described above became the basis for selection of centromeric BAC clones with a high probability of forming a functional centromere. Out of approximately 8,000 centromere-specific BAC clones, 84 “core-set” clones, nine chromosome 4-specific Mo17 and B73 clones, and a BAC clone with inverted arrays of CentC repeats were selected. All these BAC clones were retrofitted with the Tn5-3 custom transposon and used for immature embryo transformation. BAC clones from all three groups produced minichromosomes. To date, 15 events (about 3% of the total number of events analyzed) were found to contain minichromosomes with FISH-detectable marker genes (DS-RED probe) and CentC repeats. As well documented for HACs, minichromosomes can be produced via three distinct mechanisms: telomere-directed truncation of one or both native chromosome arms (maintaining the native centromere), via de novo centromere formation on the reciprocal product of a telomere-directed truncation, or by de novo assembly of the entire minichromosome from DNA fragments delivered to the cell. In Table 1, we summarized our results and indicated which of these mechanisms we feel most likely was involved in the formation of the minichromosomes described in this study. In total, we detected 73 events containing truncated chromosomes. In several, it appeared that truncation of both arms may have led to the creation of minichromosomes containing native centromeric segments. Alternatively, de novo centromere formation within a native chromosome may have led to breakage and loss of the fragment containing the native centromere. As would be expected in these scenarios, these events contained 19 normal chromosomes plus one minichromosome. In one event, when B73 chromosome 4-specific BACs were used, 19 normal chromosomes were complemented with two minichromosomes. The two minichromosomes in this event had distinctly different morphologies. One contained a native centromere and exhibited truncation of parts of both arms. The second minichromosome most likely was the result of de novo centromere formation on one of the truncated fragments. However, we were most interested in those events where the diploid set of 20 maize chromosomes was complemented with one, two, or three minichromosomes suggesting that these minichromosomes could be the result of de novo assembly. Analysis of these minichromosomes indicated that all of them greatly exceeded the size of the original BAC-based constructs used for transformation which ranged from 75 to 190 kb. This suggests that processes such as concatamerization, rearrangement, and/or amplification of the original DNA occurred during minichromosome assembly, which is consistent with observations made for de novo minichromosome formation in mammalian cells (Lim and Farr 2004). Further FISH analysis performed on several events demonstrated that in addition to the introduced DNA sequences (minichromosome shuttle vectors and constructs containing developmental genes, ZmODP2 and ZmWUS), maize genomic sequences were interspersed within new minichromosomes as indicated by hybridization with four common retroelements, Huck, Opie-2, Prem-2, and Grande, as probes. This result raised a question about the origin of these sequences and the mechanism of minichromosome formation—de novo assembly versus integration followed by telomere-directed truncation. To address these questions, we performed an additional analysis on three minichromosome events in which one to three minichromosomes complemented a set of 20 maize chromosomes. FISH analysis using a probe representing the entire BAC DNA constructs used for transformation showed a high degree of coverage across the minichromosomes indicating that the BAC sequences were interspersed with genomic sequences. We also used a set of five different repetitive sequences to perform detailed comparative karyotype analysis between wild-type Hi-II and transgenic cells. No obvious aberrations were detected in the native chromosomes in these events. In previous studies, in which transgene integration and subsequent chromosome truncation has been observed, this typically leaves characteristic “footprints” such as chromosome abnormalities and/or hybridization of transgenic sequences at the point of fragmentation (Harrington et al. 1997; Yu et al. 2007). All of our 73 events with truncated chromosomes were consistent with this, exhibiting hybridization to transgenic sequences at the apparent fragmentation point. In contrast, we did not observe similar evidence that would suggest telomere-directed truncation in the analyzed minichromosome events. Minichromosomes observed in our study obviously have common features with HACs: they contain the original constructs used for transformation including exogenous markers and they exhibit an increased size probably necessary for their stability and proper segregation. However, we also demonstrated the presence of common retroelements within the minichromosomes. While retroelements have not been observed within HACs (Ikeno et al. 1998; Ebersole et al. 2000), it should be emphasized that only one class of human retroelement (Alu) was tested in these studies. Instead of probing for the inclusion of retroelements in HACs, most of these publications have relied on chromosome-specific, and therefore, nonrepetitive sequences to prove the absence of genomic sequences in artificially created chromosomes. The inclusion of retroelements in our maize minichromosomes may have resulted due to differences in the target cells and/or the transformation method used. What are these differences and why might they be critical? First, target cells used to generate HACs are cultured cancer cells (line HT1080) while we used normal immature embryo cells. Second, embryo cells in our experiments went through an osmotic shock which is a necessary pretreatment for microprojectile bombardment. Finally, microprojectile bombardment produces a very different type of physical disruption in comparison to mammalian transformation methods, and the microprojectiles are capable of physically shearing DNA molecules in the nucleus. The latter would create DNA fragments of various sizes which, consequently, could participate in minichromosome assembly through double-strand break repair (DSBR) mechanism. Such differences within the cellular environment during minichromosome formation could result in a different composition of plant minichromosomes relative to those observed in HACs. Minichromosomes, as well as transgene loci integrated into native chromosomes, are the result of DSBR and nonhomologous end joining, which is not restricted to introduced DNA molecules. It has been demonstrated that various genomic sequences are involved in transgene loci formation upon microprojectile bombardment (Svitashev and Somers 2001; Svitashev et al. 2002; Makarevitch et al. 2003). In the minichromosome events analyzed in this study, the retrotransposon probes did not hybridize in a localized manner, but instead were found to be interspersed across the entire minichromosome. Such an even interspersion of retroelements and introduced DNA molecules is consistent with a random DSBR mechanism of minichromosome assembly. Moreover, retrotransposons, which represent a considerable part of the maize genome, are active elements and are often found extrachromosomely, for example at levels of one per 1,000 ESTs (Vicient et al. 2001). It has been shown that retrotransposon transcriptional activity can be considerably elevated by various biotic and abiotic stresses such as wounding and tissue culture (for reviews, see Kumar and Bennetsen 1999; Mansour 2007). The maize immature embryos used in our experiments underwent several stressful steps within a short period of time (embryo excision, osmotic stress, wounding by microprojectiles, and tissue culture), and were thus likely to have an increased level of retrotransposon transcriptional activity. Under these conditions, the episomal retroelement sequences would likely participate in the formation of de novo minichromosomes along with other genomic sequences and contribute to the RTs presence in the minichromosomes. Another possible explanation for the presence of genomic sequences in minichromosomes would involve a different mechanism of minichromosome formation associated with integration of the transgene followed by telomere-directed truncation. As described above, in this case, minichromosomes can have either native or de novo assembled centromeres. With these scenarios, the full set of 20 normal maize chromosomes can theoretically be restored via mitotic nondisjunction. While possible, the likelihood of nondisjunction occurring in all minichromosome events that contained a full set of 20 chromosomes is remote; even more so in those cases where we observed more than one minichromosome with different morphologies within the same event. Moreover, if we assume that a minichromosome carries a native centromere, it would have to result from two integrations occurring close to the centromere on both arms of the same chromosome followed by truncations. For maize, the probability of two independent integration events on the same chromosome is approximately 5% (even lower if both should be on different arms and close to the centromere). In our experiments, we observed truncation in approximately 3% of events analyzed. The probability of truncation at both loci will, consequently, be about 0.1%. We observed events with additional chromosomes (trisomics) at a very low frequency (less than 1%) which can be used as an estimate of the expected frequency of mitotic nondisjunction. Based on such considerations, this sequence of events leading to a “20 + 1” event would occur at an extremely low probability. Our observed frequency of minichromosome formation was about 2–3%, which was much higher than we would expect in the above mentioned scenario. In the case of a single integration, minichromosomes could be formed through the following steps: telomere-directed truncation, development of a de novo centromere, loss of the majority of the chromosome containing the native centromere, and finally, again, mitotic nondisjunction to restore the full set of 20 chromosomes. Once again, such integration/truncation/de novo centromere formation/nondisjunction mechanisms are possible, but likely at very low probabilities. Moreover, any scenario involving integration, truncation, and mitotic nondisjunction mechanisms do not explain how genomic DNA became interspersed with exogenous DNA across the minichromosome. 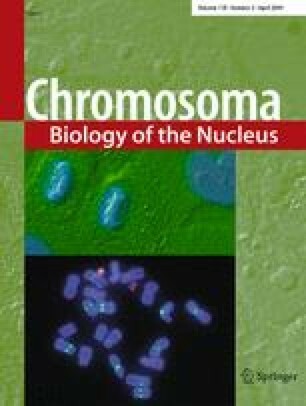 Based on our data, we conclude that the majority of our minichromosome events with 19 native chromosomes most likely resulted from chromosome breakages. Currently, for minichromosome events with a full set of 20 native chromosomes, we cannot completely rule out any of the potential mechanisms of minichromosome formation. However, based on results of our analysis, taken together with the probabilities described above, we conclude that for these events, de novo assembly may represent a more likely explanation than truncation-mediated minichromosome formation. In our experiments, we had to answer another important question—could plant recipient cells provide an environment and the necessary components to support self-assembly of chromosomes with functional centromeres? Assuming that double-strand break repair mechanisms are involved in the assembly of chromosomal components into an artificial chromosome in cellulo, we speculated that it might be important to deliver minichromosome components to actively dividing plant cells such as those found in the scutellum of immature embryos. In addition, to promote cell division upon delivery of transgenic constructs, we co-transformed plant cells with helper genes ZmODP2 and ZmWUS. In maize, ectopic overexpression of ZmODP2 and ZmWUS has been shown to stimulate cell division, somatic embryo development, and callus growth (Gordon-Kamm et al. 2005; Lowe et al. 2004). The use of these genes also helped to solve another technical problem. As with other eukaryotic systems in which successful minichromosome assembly has been demonstrated, high transformation frequencies provide an essential platform for this process. In our transformation experiments, the accelerated growth phenotype was successfully used to recover large numbers of independent transformation events. Further, events containing minichromosomes were recovered only when the ZmODP2 and ZmWUS expression cassettes were present. In contrast, when ZmODP2 and ZmWUS were not included, only integration of the minichromosome constructs was observed. This is consistent with a recent report by Phan et al. (2007) in rice, in which all recovered transformation events contained only integrated centromeric BAC sequences. While helpful in increasing both the cell division rate and overall transformation efficiency, using the strong ubiquitin promoter to drive expression of ZmODP2 made regeneration of plantlets very difficult, and the few resultant plants were infertile. Similar results have been observed in studies in the absence of minichromosome components (Gordon-Kamm, unpublished results), suggesting that the observed regeneration problems and infertility are likely the direct result of strong overexpression of ZmODP2, and not due to minichromosome components per se. Further analyses of transgenic events confirmed that the ZmODP2 and/or ZmWUS genes were integrated into the genome or assembled artificial minichromosomes, and future experiments will include strategies to mitigate this impact. The ultimate size of stable minichromosomes is an important feature in artificial chromosome development. In the events we recovered, the minichromosomes were substantially larger than the BAC-based constructs clones originally introduced, and were estimated to be 15 to 30 Mb. An ideal system would result in the smallest minichromosome possible while still conferring stable copy number and proper transmission to daughter cells. Analyses of mitotic and meiotic stability of naturally occurring and engineered minichromosomes in yeast, human, and plants have indicated that there is a size threshold below which stable propagation of linear chromosomes is not possible (Zakian et al. 1986; Maguire 1987; Schubert 2001; Phelps-Durr and Birchler 2004; Han et al. 2007). Well-defined series of linear human X chromosome centromere-based minichromosomes have been used to investigate the influence of chromosome size and structure on their stability and segregation in mammalian cells (Mills et al. 1999; Spence et al. 2006). In these studies, a clear relationship between overall chromosome size and mitotic stability was observed, with decreasing size leading to increasing loss rates. In human HT1080 cells, the size threshold for mitotic stability was estimated to be approximately 1.6 Mb. However, all minichromosomes which were smaller than approximately 5 Mb demonstrated reduced stability and more segregation errors than normal chromosomes. In plants, naturally occurring minichromosomes have been observed in various species (Gindullis et al. 2001; Schubert 2001; Murata et al. 2006, 2008). A minimal size of approximately 5% of the haploid genome has been suggested for chromosome stability and transmission through meiosis (Schubert 2001). However, species with a similar genome size may differ considerably in chromosome number and, consequently, chromosome size. A better reference point might be the smallest chromosome for a given species. We propose that the minimal size of a stable minichromosome should be about 10% of the size of the smallest native chromosome in a particular species. In human cells, the minimum size of minichromosomes demonstrating high levels of stability was 5 Mb, which is about 10% of the smallest human chromosome. Extrapolating to maize, in which the smallest chromosome is about 170 Mb long, a stable minichromosome would be predicted to be about 15–20 Mb, which is consistent with our results. Artificial minichromosomes may soon begin serving as plant transformation vectors that could potentially address several important requirements, providing stability, autonomy, and a high capacity for stacking of practically unlimited number of genes with stable gene expression. They can also be used for introgression of large segments from exotic germplasm, placing of complex gene sets of multigene families and biochemical or developmental pathways, cloning large pieces of genomic DNA for complementation analysis, and artificial segmental duplication surveys. Free of linkage drag, plant artificial minichromosomes could be potentially transferred across a wide variety of genotypes through conventional crosses. Furthermore, the ability to create artificial minichromosomes may provide a powerful tool for studying the elements essential for chromosome function and mechanisms of chromosome segregation in mitosis and meiosis. Our results represent a first step in developing such vectors. Future studies will be required to address critical questions related to better characterization of functional centromeres, mechanisms of their formation, size requirements, and organization of plant artificial chromosomes. Answering these questions will bring artificial minichromosome technology to the frontline of applied plant biotechnology. This article is in memory of our colleague, Evgueni Ananiev, whose scientific vision and leadership were critical for the success of the project. The authors gratefully appreciate the technical assistance of Micah Sturdevant, whose full-time help was integral to the completion of this project. We would also like to recognize the valued technical advice and/or assistance of George Hoerster, Keith Lowe, Mike Miller, Zuo-yu Zhao, Dave Peterson, Grace St. Clair, Jan Swenson, and Jane Snyder. We are also thankful to Olga Danilevskaya and Carl Falco for critical reading of the manuscript. We also thank Carl Falco and Antoni Rafalski for fruitful discussions and their valued support of the project. We thank Ron Phillips, Howard Rines, and Ralf Kynast (University of Minnesota) for their kind donation of the oat–maize chromosome addition lines.